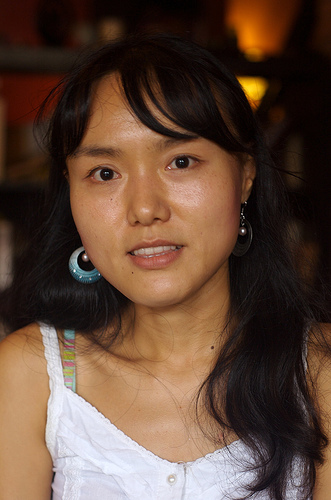 Jia is a novel based in North Korea written by a South Korean. Interesting right? It’s also supposedly the first novel about present-day North Korea to be published in English. The author was inspired to write this novel when she met a women, she calls Jia, while traveling on a bus in China. In the book, Jia spent the first 5 years of a life in a North Korean Mountain Gulag where her elder sister and her grandparents have been sent as a punishment for something their son did. Her grandparents manage to smuggle her out of the gulag so that she could have a better life. Jia is sent to an orphanage in Pyongyang, the capital of North Korea, where she lives for the next 15 years of her life. I didn’t understand why my life couldn’t be my own, why there was always a chain, emerging from deep in the past, stretching into the present, that bound me to my fate. I’m sure there are(were?) thousands of North Koreans who think that way, whose present and future revolves around their past. It’s sad to see to see how much a government can control the lives of their citizens. The author brings out the desperation and loneliness of Jia very well. When Jia has to leave North Korea to survive, we also get to know how Jia and the people she meets along the way have to run from North Korea to seek a better future in-spite of all the risks. It’s a heartbreaking book for sure, but it’s also a glimpse into thousands of North Korean lives. I loved how this book could take me to a place I’ve never been before. She describes the 13th World Festival of Youth and Students that was held in the country. She describes how the government puts up a front for the international audience. She also shows the state that the country and it’s people went into during the The North Korean famine. I found many parallels in this book and Long Road Home by Kim Yong, a memoir of an escaped prisoner from North Korea. On the flip side, the writing was very amateurish. I could tell this was the authors first book. It was also not properly structured and the narrative kept jumping from one person to another. I think the author wanted to include everything that she learned about the North Korean lives while she was working with the refugees in China. It reads more like a page turning memoir than a novel. Nonetheless, this is one book I would definitely recommend because this book and the events are still fresh in my mind and I keep thinking about all the characters in it. If you know nothing about North Korea, this book might fill that gap in some way. If not for the writing, this book could have been excellent, but I guess ‘very good’ is not bad either. This counts for the East and SouthEast Asia Challenge. This entry was posted in Adult Fiction, Books, Books read 2011, East and SouthEast Asia Challenge, Reviews and tagged North Korea, refugees. Bookmark the permalink. Hm, I not entirely sure I could make it past amateurish writing. you read such diverse stuff! !Going by your review i would love to read this book. This sounds like a very moving and emotional read? I guess we all know what goes on behind closed doors, no matter where we live, but try to close our eyes and minds to it. I say this, because I have a couple of books, of a similar theme, sat on my shelves, but for some reason I keep putting off reading them. Many of the authors never go on to write anything else, but just have to set down on paper how they feel about the repression and abuse that goes on around them. I have this in my pile for the longest time and I’m excited to read your review. I will still read it even though it’s amateurishly written. I picked this up for the East and Southeast Asia Challenged based on your review and I’m glad I did. I agree with your review completely. It offered a lot of insight into the lives of North Koreans and did a great job of exposing the plight of North Koreans. You also nailed the one weakness of the novel. I thought the writing style was good and pretty easy to read, but I think the author tried to pack too many stories in. Everything was powerful and definitely added to the readers understanding of the situation in North Korea, but for several of the characters either popped into the story and popped out without any resolution or else the resolution felt very rushed and tacked on (Gun and Sun, for instance). I think it would have benefited from either being longer (though I think it might have dragged) or else cutting out certain parts to tell in another novel. All of the stories did need to be told, but I agree that it felt like the author was trying to cram too much into the narrative.